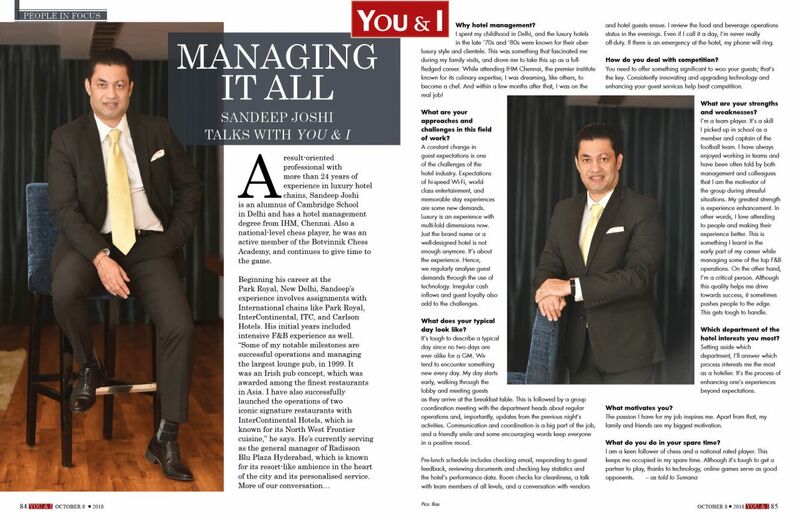 A result-oriented professional with more than 24 years of experience in luxury hotel chains, Sandeep Joshi is an alumnus of Cambridge School in Delhi and has a hotel management degree from IHM, Chennai. Also a national-level chess player, he was an active member of the Botvinnik Chess Academy, and continues to give time to the game. I spent my childhood in Delhi, and the luxury hotels in the late ‘70s and ‘80s were known for their uber-luxury style and clientele. This was something that fascinated me during my family visits, and drove me to take this up as a full-fledged career. While attending IHM Chennai, the premier institute known for its culinary expertise, I was dreaming, like others, to become a chef. And within a few months after that, I was on the real job! What are your approaches and challenges in this field of work? A constant change in guest expectations is one of the challenges of the hotel industry. Expectations of hi-speed Wi-Fi, world-class entertainment, and memorable stay experiences are some new demands. Luxury is an experience with multi-fold dimensions now. Just the brand name or a well-designed hotel is not enough anymore. It’s about the experience. Hence, we regularly analyse guest demands through the use of technology. Irregular cash inflows and guest loyalty also add to the challenges. It’s tough to describe a typical day since no two days are ever alike for a GM. We tend to encounter something new every day. My day starts early, walking through the lobby and meeting guests as they arrive at the breakfast table. This is followed by a group coordination meeting with the department heads about regular operations and, importantly, updates from the previous night’s activities. Communication and coordination is a big part of the job, and a friendly smile and some encouraging words keep everyone in a positive mood. off-duty. If there is an emergency at the hotel, my phone will ring. You need to offer something significant to woo your guests; that’s the key. Consistently innovating and upgrading technology and enhancing your guest services help beat competition. I’m a team player. It’s a skill I picked up in school as a member and captain of the football team. I have always enjoyed working in teams and have been often told by both management and colleagues that I am the motivator of the group during stressful situations. My greatest strength is experience enhancement. In other words, I love attending to people and making their experience better. This is something I learnt in the early part of my career while managing some of the top F&B operations. On the other hand, I’m a critical person. Although this quality helps me drive towards success, it sometimes pushes people to the edge. This gets tough to handle. Which department of the hotel interests you most? Setting aside which department, I’ll answer which process interests me the most as a hotelier. It’s the process of enhancing one’s experiences beyond expectations. The passion I have for my job inspires me. Apart from that, my family and friends are my biggest motivation.